Among ITSM professionals, âthe cloudâ, has been a source of fear, uncertainty and disruption, the likes of which hasnât been seen since Y2K. In the face of this change, IT organizations, technology and consultants have relied on their traditional strengths â technology and process. Unfortunately, the individual practitioner and the organizations in which they work have been practically ignored. With the proliferation of frameworks, national and international standards, methods and approaches, as well as various certificate and certification programs, it can be challenging to choose the right mix of these elements to fit the needs of the organization and those who do the work. 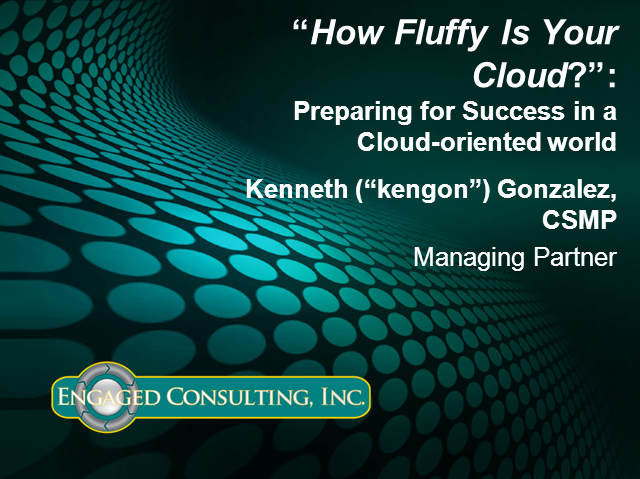 â¢What is the right mix of knowledge, skills and abilities required to be successful in this new, cloud-centric world? â¢How do we evaluate our options? â¢What is the best fit for future growth and opportunity? In this session, we will directly address what practitioners should do to be better prepared to discover meaningful answers to these questions. We will go beyond the âcommon senseâ connections and identify the key elements required to have you, your team and organization be successful. Title: How Fluffy Is Your Cloud?